Pics and Kicks: For the Grandmas. I am so proud of Raleigh! 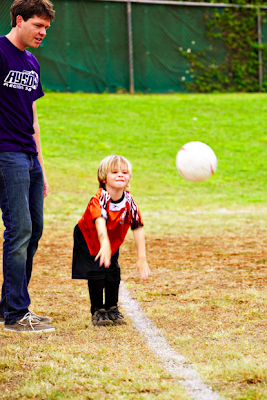 He had his first soccer game on Saturday. They had SO MUCH FUN! 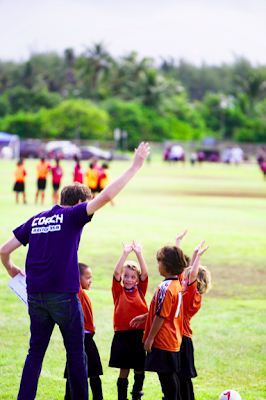 I am also proud of Richie for achieving his life long goal of coaching his kids in sports. He has honestly been talking about this since the day Raleigh was born. . . I think he has more fun than the boys by a long shot! 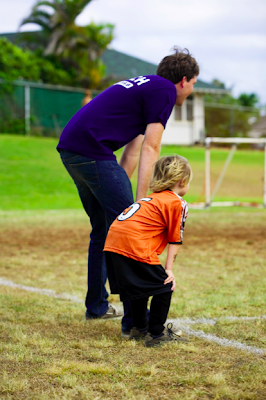 He always comes home from practice and says, "It's not about building soccer stars, it's about building little boys." I love that man with all my soul. Here are some snap shots from the game. Enjoy. This is so cute. I love all the pictures. what a good dad. I'm missing Enzo's daddy right now. Single parenting is not fun. Good thing it'll end in 3 weeks. I'm so in love with these I can hardly contain myself!!! And it's also very deja vu-like! It seems like yesterday that Richie was in the soccer uniform with me taking the pictures. Keep 'em coming, please, Natalie! They thrill me. Seriously cute photos. I love the one of dad and little boy leaning on their knees in the same way! Adorable! the photos are great - what lens were you using? how cute are these????? More dads need to become involved and realize what a positive effect it can have in a child's life. These are Precious!!! Way to go Mom!! these are great! i love, love, love that fourth picture. it's adorable! Thanks SO much Nat! My Dad was my coach in EVERY sport, every year since I was 5. I've planned on being my kids coach since I was 5 so I could be like my Dad. Raleigh tells me he can't wait to coach his kids. 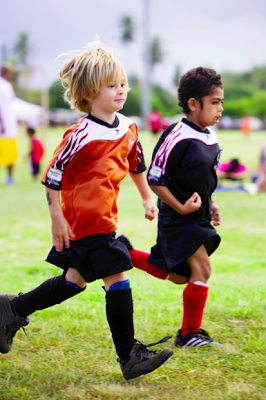 In AYSO only 3-4 kids on each team can play on the field at the same time. So they have to take turns on the sidelines. I told them that there is nothing wrong with being on the sideline and it is okay and good to rest for a bit. That picture of Raleigh and I with our hands on our knees was Raleigh's first time on the side. I told him I needed him to be my assistant coach and told him that 'this' (putting hands on your knees) is how you coach! I LOVE these!! !I can't stop looking that them! 70-200mm IS 2.8 . . I love it . . . other than that it's ginormous. . . It's not very inconspicuous. . . which I hate. But it is a great lens. Amen. I keep thinking, GOSH I WISH EVERY BOY IN THE LEAGUE HAD MY HUSBAND AS A COACH!! His next step is to have a HUGE professional banner made of the "Orange Tiger Sharks." He thinks it will make them feel powerful and confident. . . ha ha! I'll totally post pics of it on the blog once it's done. such great photos!! The colors are awesome!! Thanks for the great shots! I look forward to the BANNER! The boys are AWESOME! I just love that they're having a blast out there...with more Saturdays to come...love it! I love looking at your blog and I thought I would make a comment about these ones. I love the bright colors of all these pictures. I think my favorite is the first one with all of their hands raised. What great real life pictures. What an awesome DAD! These are so cute, great job! Oh Natalie! This second picture is an exact replica of YOU when you started playing at five. I love that Richie is coaching. It's so perfect for both of them. Keep the pictures coming--I love the joy they bring! Thanks for being such phenominal parents. You make me cry. Those little boys are so blessed. P.S. - I really love that Raleigh's shin guards go clear up over his knees! the 70-200mm IS 2.8L is exactly what's on my wish list...hopefully before the end of the year that baby will be ALLLLLLL mine! thanks for the info natalie. I'm not even related to you or pregnant and I started to get emotional over this post! What a great dad. 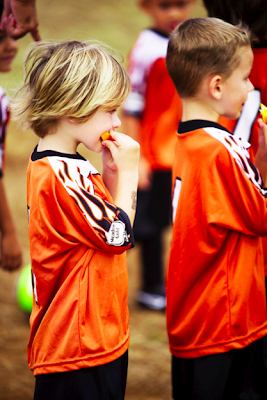 I have some great memories of soccor and orange smiles too. Those pictures are so sweet and I can just imagine how excited both of those "boys" are. Go Raliegh! Go Richie! Go Orange Tiger Sharks! I was just wondering, did you do some post-production on these pictures to get the colors so bright? Or is this just the way you took the pictures? How did you get these colors so bright and sharp? I shoot with a Canon 5d. The images above were processed slightly in photoshop. An easy way to get a similar look would be to download Pioneer Woman's action set. . . http://thepioneerwoman.com/photography/2008/04/actions/. She has a set called Bright and Colorful. . . or something like that which would give a similar feel to the images above.